We have a little chat on the Right Mouse Button topic. I also thought there is no real way to have the ability of repairing thing and crafting with it, so I'd say we can show only one button of those two. I also can't quite say we'll be using abilities other than crafting on items, so I left it this way. Note that if we would give our player the ability of using skills on items, the middle field may be used for that purpose. EDIT: after short brainstorming in the top left corner could be "Use". I like the design of your mockup, Q_x! 2. There might be problems when different amounts of interactions are possible with one item. So maybe we need totally different menu? RMB for Use menu and drag and drop to yet-unplanned slot to place thing onto the ground? Plus click-click to trigger a "default action" for any item (eating edible stuff, repairing broken, wearing wereables)? How about an expanding tree. I designed this thing myself. You can open a new branch by clicking the right button. Of course the buttons should be replaced with the appropriate icons. Problem is when you craft things - basically like 20-30 branches can pop up at a time - like when you want to improve your shoes and you can sew them with waxed thread, tared thread, tar the thread they have or wax it, mount snowshoes under it, maybe even mountain racks, mount gators to them, patch a hole, attach new layer of skin under it... Mechanics is pretty dense around it. Also, reading it may be hard. You will get pretty chaotic visuals when sliding whole tree and eyes will be insta-tired when trying to find the right item quickly. Maybe it would be an option not to "unwind" parts of tree only, but also to "wind up" all the past items into a one labeled "back"? My overall point is still to emphasize the story, not bling bling features. But emphasize, not dominate. Are you serious? If you really need to open 20-30 branches just to upgrade your shoes, your crafting system is undeniably overcomplicated. How about making it so that the item you upgrade can be opened like a container, so that it has upgrade slots you can fill with whatever stuff you wanna attach to it. Well, crafting is a thing in progress (I also have to share my thoughts with zenbitz on that), so the solution has to be more or less elastic. But yes, I'd expect to have at least like 10 things to choose from when I choose a tool like an axe. Also thing to think of: how would branch differ from leaf visually? I'm still thinking about menu with RMB = Use (traditional context menu will be good in this case, there are no "standard elements" and the text is most important), click-click = default action and drag and drop to wear, place in slots and drop via "drop onto ground" slot. @drtrace: very nice but I would prefer a simpler (non-branching) menu. Hopefully that's possible. What app did you use for making that graph? Doubleclick for default action sounds good. We need to figure out how complicated the skill system will be from the perspective of the player... Must... start.. thread.. I drew it in Paintshop. The idea was that you can see everything instead of having to go through lots of menus. Let's not get too crazy with the different thread types. Crafting will have to be a different interface. Yep, I totally agree on this. We can't foresee all possible GUI options at this point so we have to start somewhere, agree on something that might work and implement it. If it turns out that this interface will need some tweaks down the line to work with new features that get implement, that's not a major problem. To get things started, we should just worry about the core inventory for now and try to come up with something we can implement for GUI prototyping purposes. Not sure if this has been addressed already, but do we plan to make the inventory and other in-game screens pause the game while open? I'd like to hear zenbitz' comments on this, since this would likely influence how combat works in addition to the player's immersion. Its not anything more but my opinion, but opening any window should pause the game. oopening any window should pause the game. I also favor this for now. I would also favor that the right-click context menu (see below) opened in the world view should also pause the game, so 'selected' npc's can't walk away while you decide whether to look at or talk to an npc. 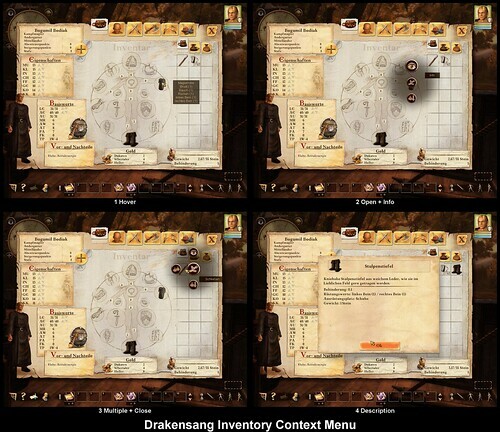 PS: About inventory context menu: I suggest we talk about this later (I think zenbitz said that to me) and try mocking up a crafting screen for now.